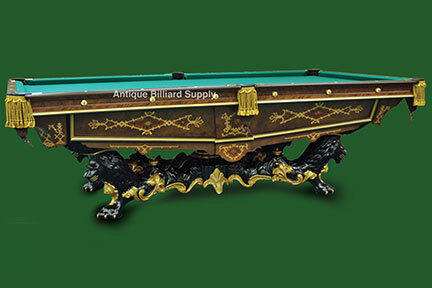 #4-16 A very early example of the Brunswick Monarch table produced in the 1870s. Walnut background with extensive inlay of exotic woods on all surfaces. Genuine 18-karat gold accents. Highly desirable nine-foot size. Four-piece slate playing surface. Fully restored and ready for immediate delivery.